Here is my latest Bible art, inspired by my sweet friend who showed me this video that shows what beautiful harmonies cricket chirping makes when slowed down. It is spine-tinglingly beautiful. If I were to imagine what the throne room of Heaven might sound like, this would be it. The sound conjures images of angels circling the throne singing to one another of God’s holiness. My sweet friend also showed me the beginnings of her own cricket inspired art and the verse she’s chosen to accompany it, Psalm 104:33. It says, “I will sing to the Lord as long as I live; I will sing praise to my God while I have being.” What a perfect creature the cricket is to illustrate this verse. It is impossible to think of the cricket without also thinking of its chirp. The cricket’s song is a huge part of its life. I don’t know what else they do as they go about their cricket days, but I know that if a cricket gets trapped in your room at night, he’s going to sing you the song of his people and neither of you will get any sleep. He will make his presence known! Oh, that it would be this way in all of our lives. How wonderful to spend our days singing God’s praise. I knew that I wanted to follow my friend’s example and honor the worthy cricket in my Bible, too. So, I went on the search for some chirp-y inspiration. I am always drawn to whimsical subjects in bright colors. When I saw this print on Pinterest, I had an idea…but would it work? I like the watercolor look of these cute little guys and the repetition on the design. I thought a stamp would be perfect, but who has a whimsical grasshopper stamp just laying around? Not me. What I do have on hand is craft foam, so I decided to try something I’m going to call “free-stamping.” It’s really just a simple form of printmaking with craft foam and markers. 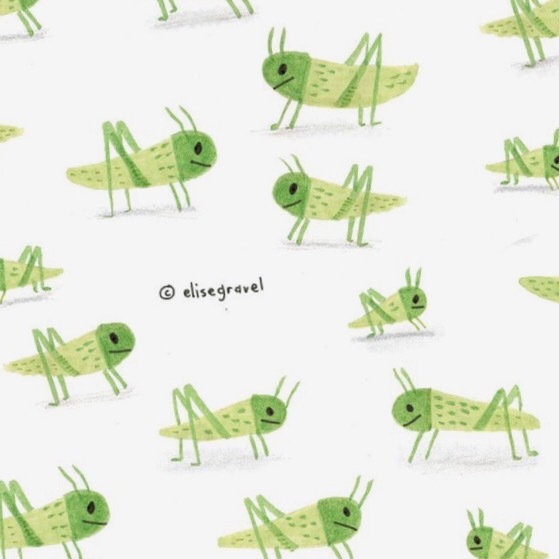 For my page I made three different cricket stamps and repeated them each at least once to come up with this swarm of whimsical little critters. Also, making three stamps and using each multiple times, gave me a pattern-like affect, even though the crickets are bunched together rather than placed evenly on the page. I think the technique could work better with a little tweaking, so I’m going to share it with you here in a quick tutorial video and I’d appreciate any ideas you come up with for making it better. This post contains Amazon affiliate links. While this is done for your convenience and to promote products that I like and use, a portion of any sale made through these links goes to support our family and make this blog possible. We thank you for your support. Here are all of the supplies I used in this video, in case you want to give it a try: Zig dual tip markers (set). These have a scroll tip that makes for awesome lettering! This is a set of various yellows. You’ll also need a light blue, which is not a part of the set linked above. Here is a light blue pen similar to the one I used. These are the craft foam sheets I like to use. There are so many fun things you can do with these pieces of foam! I even make my own shape stamps with them, like my balloons. And, as always, my extra small tip black pen. In this video I am using one by American Craft, but I have since moved on to the Micron 01 or the Faber Castell Extra Small. Let me know what you think. Would you try free-stamping?